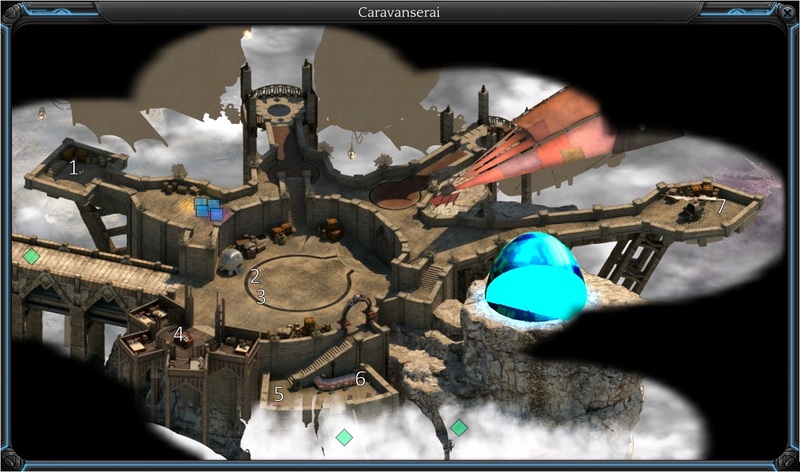 Caravanserai in Torment: Tides of Numenera is an area in Sagus Cliffs，it is the major Airship Port of city. 2XP, open the drawer of a nightstand in the inn. 2XP, recongnize Tranquility's voice modulating and ask her about it. 3XP, tell silver orphans the foreman in Underbelly. 3XP, tell silver orphans Ziobe in Fifth's Eye. 2XP, figure the riddle given by Sylph (Consciousness),and answer her question. 2XP+3XP, remeber where have you see Sylph before. 2XP, ask Tarnach Hobbes what he staring at. 2XP, ask Tarnach Hobbes what he has seen after you know what Akar means. 2XP, ask Tarnach Hobbes what he is becoming after you know what Akar means. Contingent Subroutine,tell silver orphans the foreman in Underbelly. Stillness Cage,tell silver orphans Ziobe in Fifth's Eye. Antique hair clip,open the drawer of a nightstand in the inn. Thermodynamic Detonation, tell silver orphans Sylph. Last Castoff need to persuade Master Rennio to resume his flights to Valley of Dead Heros,or pay 600 shins for it,or finish questThe Airship Theif.